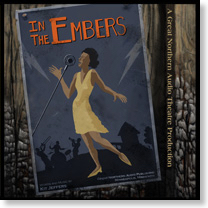 The Twin Cities Geek website posted a review of In The Embers, written by Kelly Starsmore. You can read the whole review at twincitiesgeek.com. She says, “In the Embers is one for the ages and something that I will come back to time and time again.” We’re glad she liked it, and we hope you will get yourself a copy and give it a listen, too. You can see more here at Great Northern Audio. It’s available for download from ZBS.org and at Blackstone Audio’s Downpour site. In the Twin Cities you can get compact discs of the show at Uncle Hugo’s SF Bookstore, and at Dreamhaven Books. Oh, and there’s a 60-minute documentary on The Making of In The Embers that includes interviews with the producers, the actors, and the musician, and a few comments from our mentor, Tom Lopez of ZBS. It’s entertaining as well as having something to say about the making of modern audio theater. There’s a link to the documentary on the ZBS home page, and it’s free. And since we’re speaking of ZBS, they also have links to some new podcasts all about ZBS’s use of binaural sound recording. There are already several episodes up there, so lots to listen to, including complete ZBS stories, and some examples of ambient binaural recording that is full of fun and wonder. Narrated by Meatball Fulton. To get the full effect of binaural be sure to listen using headphones. Sound Affects: A Radio Playground, on community radio KFAI in Minneapolis, is broadcasting another ZBS project, The Fourth Tower of Inverness, the very first Jack Flanders adventure. There are a few episodes each Sunday evening at 9:30 PM through June, on 90.3 FM and 106.7 FM in the Twin Cities, and streaming live at KFAI.org. Archives of the show are kept for two weeks, so don’t hesitate to listen now. Annnnd, since we are on the subject of modern audio theater, there is a list of the latest finalists in this year’s Mark Time Awards competition posted. Take a look at them at marktimeawards.org. Some good new works in the genre’s of science fiction, fantasy, and detectives. The winners will be announced on June 9th in Kansas City, MO, at the HearNow Festival of Audio Fiction, and presented by David Ossman. The Mark Time Awards are a legacy project of the Firesign Theatre celebrating the best in modern audio drama.